So, each Friday there will be a post about our mini farm. I think today would be a great day to share some of the weird but favorite questions I’ve been asked since we started our mini farm. Now, all the questions/comments were from folks I had never met before. Some of them were enough to make me check under the bed and behind the shower curtain when we got home. “So what came first the chicken or the egg?” Again, laughter. “I don’t know why you’re laughing. It’s a valid question.” oooohkay! “Wait, you made a gas chamber?” I said, “Yes, a gas chamber is the most humane way to kill your chickens. Peta recommends all chickens be gassed not electrocuted or their throats sliced as they feel it. We used a 5 gallon metal bucket so that it’s too small for anyone to be hurt by” To which dude says, “Hey…do you know where I could get a really big metal bucket?” The hair on the back of my neck stood up. “Are you a pot farm moocher pro?” Uh…no. We run our own farm and we garden and raise animals not pot and we’re anti mooching.” I’ve no clue. 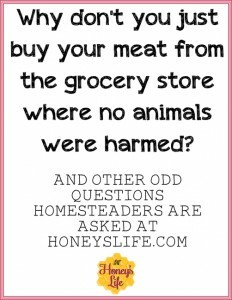 But, my FAVORITE question of all time about having a mini farm and raising animals is “I don’t know why you just won’t go to the grocery store and buy the meat there where no animals were harmed. It’s simply inhumane to raise your own animals for food” Oh my. If no animals were harmed at your grocery store then you’re not eating meat. Rock on guys! Remember to snag a button and display it proudly on your blog! Keep scrolling to enter this week’s party! 1. 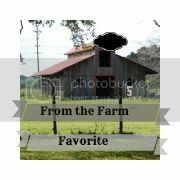 Link up to three of your best gardening or homesteading tips, farm-themed posts, recipes, homemaking and simple/frugal living tips, decorating ideas, DIY projects, craft ideas, thrifty makeovers or repurposed items, healthy and sustainable living tips, and giveaways. 3. Make sure to check out some of the other links before leaving. We can’t wait to see what you share with us! Note: Linking up to this party will automatically sign you up for an invite to next week’s party via email. To unsubscribe, please reply to any email you receive and you will be removed. Linking up also allows us permission to publish one of your photos on our blogs, Facebook, and/or Pinterest pages.